Style at Home Magazine: Featuring Me! 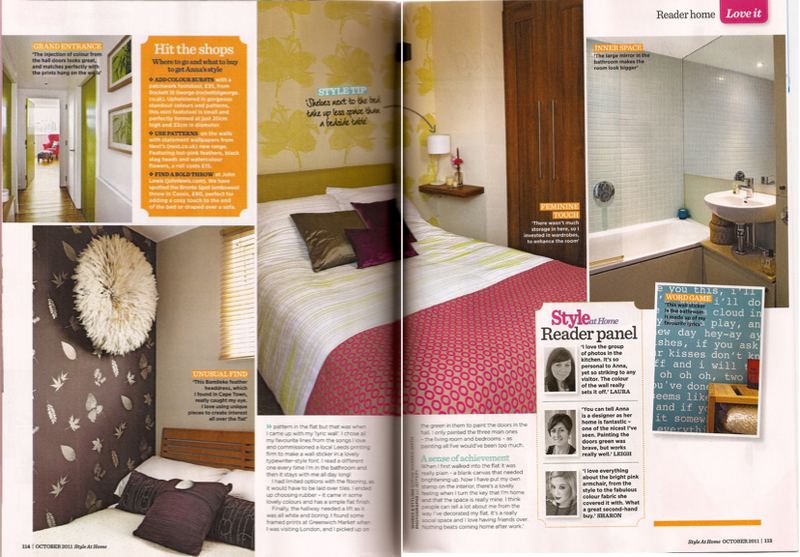 I was thrilled to be contacted by Lu Jeffrey to have my flat photographed for Style at Home Magazine! I know that my flat isn’t to everyone’s taste, but I absolutely love it! I love bright colours and bold patterns, but only used in the right amount as I love the clean and airy feeling. I’m really in to prints where the inspiration is natural items such as leaves. Sophie Warren-Smith was the stylist on the shoot and it was great to work with both her and Lu. The readers comments were really positive which was a relief to be honest. It’s always nervous showing your own home to others as they expect a lot from an Interior Designer. 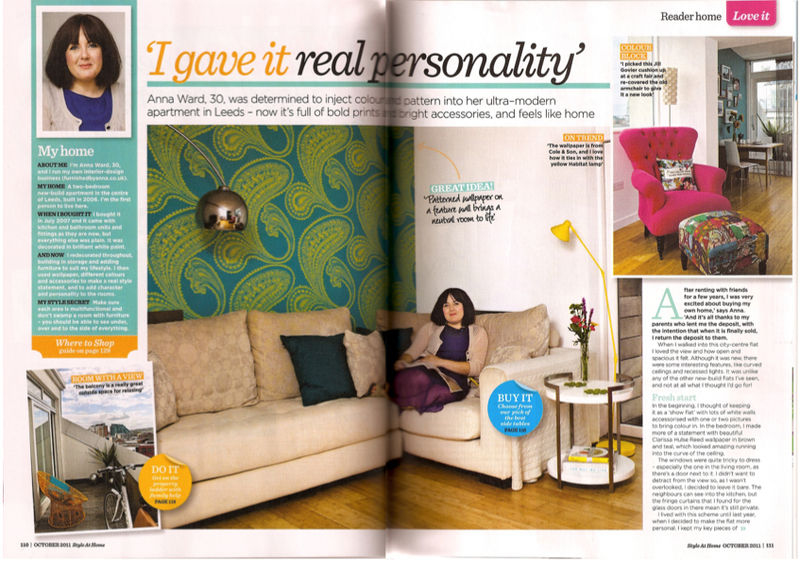 One of the readers, Leigh, said “You can tell Anna is a designer as her home is fantastic – one of the nicest I’ve seen. Painting the doors green was brave, but works really well”. Thanks Leigh! If you’d like to leave me a comment too, then there’s a box at the bottom of this page. Sophie is a brilliant interiors stylist who works for lots of magazines. She has her own blog “all things stylish and beautiful” which you can read here. 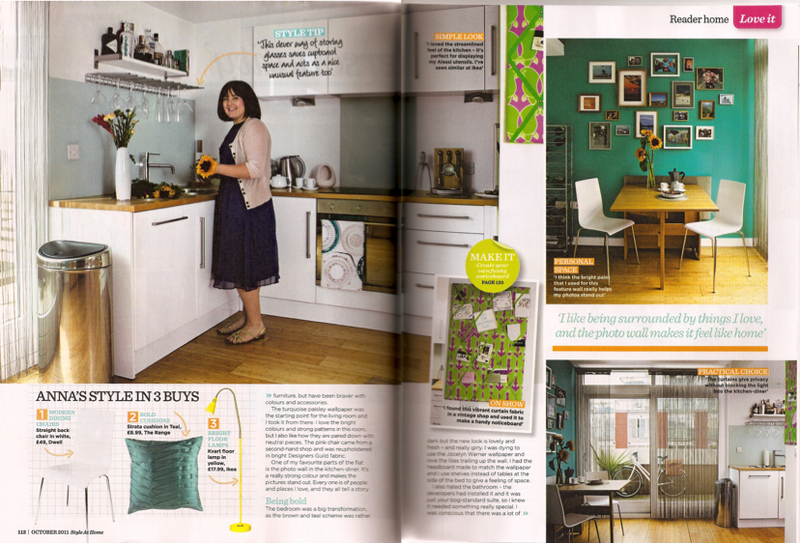 Lu is a fab photographer who reguarly features in home magazines. To get inspiration from other homes she’s photographed, take a look at her website. Creative interior design solutions to create a home you'll love. "WE NEED YOUR INSTA VOTE NOW PLEASE!!! one hour to go - most likes wins! https://t.co/iX5AqRlUGB #interiordesign"
Furnished by Anna is owned by Anna Ward, who set up the company to offer affordable interior design, without scrimping on the wow factor! Terms & Conditions | Contact Anna © Furnished By Anna. All rights reserved.